This dish requires some cooking time, but does so on its own, without you fussing. The recipe doubles easily, so you can make it tonight and enjoy leftovers tomorrow. Serve it with a side of marinated tempeh or hummus and you’ll be doing the protein strut. Recipe and photo contributed by Ellen Kanner. Heat olive oil in a large pot over medium-high heat. Add garlic and mushrooms. Toss to coat. Sauté for 8 minutes, until vegetables soften. Cover and reduce to low. Continue cooking for 30 minutes. The mushrooms will have produced a lot of juice. This is good. Stir tomato paste, lemon juice, paprika and cumin to form a thick sauce. Rinse quinoa in cold water twice so it’s free of saponin, quinoa’s natural bitter coating. Add to mushrooms. Stir in broth. Cover and simmer another 30 minutes, until the quinoa has absorbed all the liquid. 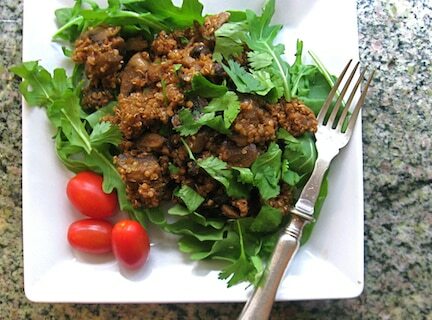 Stir gently so mushrooms and quinoa combine. Arrange spinach on a platter. Mound quinoa on top. Garnish with chopped cilantro. Here are more quinoa recipes. Ellen Kanner writes the Meatless Monday column for The Huffingon Post, is the Edgy Veggie, a syndicated columnist, and Dinner Guest blogger on Culinate. She is also a contributor to Bon Appetit, Relish, Eating Well, Vegetarian Times, More, the Miami Heraldand regional publications across the country including Pebble Beach and Palm Beach Illustrated.